One of the most significant Mughal structures, carrying some of the most spectacular tile mosaic examples, is the Gulabi Bagh Gateway. It is located on the northern side of G.T. Road, east of Buddhu’s Tomb, and past Begampura Road on the left. 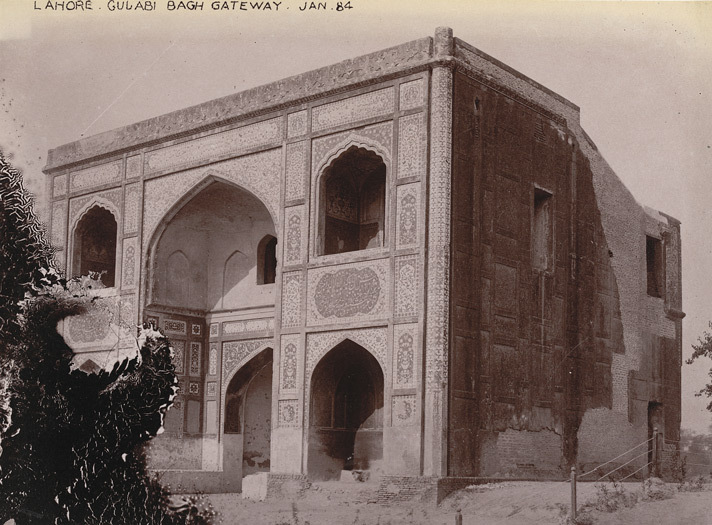 Although of considerable height (it is a two storey structure), it can be missed easily since it does not carry a dome, or other terminating elements, As is evident from its name, this remarkable gateway was originally the entrance to a garden known as Gulabi Bagh or (the rose garden), no longer extant. The name however, is also a chronogram, from which the date of construction of the gateway AH 1066 (1655) is obtained. Although the gateway has endured much damage to its decorative features, it is in a tolerably well-preserved state. 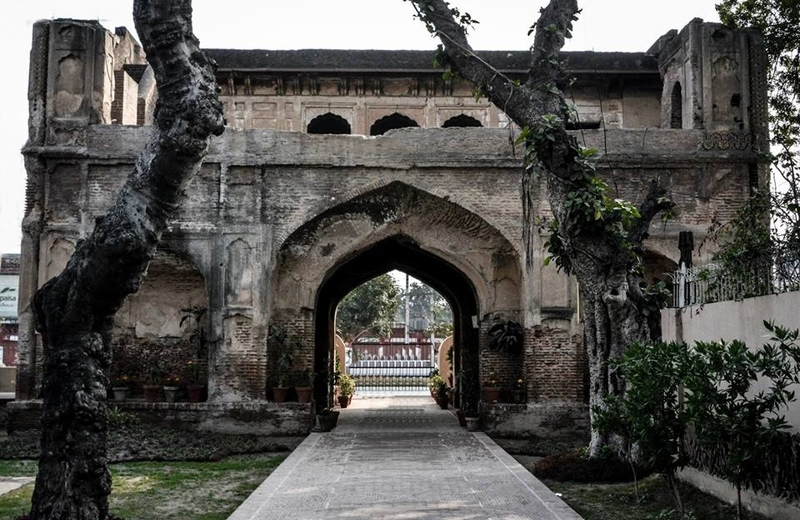 It was constructed by or in memory of Mirza Sultan Beg, a Persian nobleman and cousin of Shah Jahan’s son-in-law Mirza Ghiyasuddin (married to princess Sultan Begam). Due to his cousin’s relationship with the royal family, Mirza Sultan Beg rose to the exalted position of Mir-ul-Bahar (Admiral of the Fleet). He was obviously on extremely good terms with the emperor, who, aware of his love of hunting, presented him with a much-admired English rifle. Just two months later, the firearm proved fatal for him due to the bursting of a shell during a hunting expedition at Hiran Minar at Sheikhupura. He died in 1063/1657. 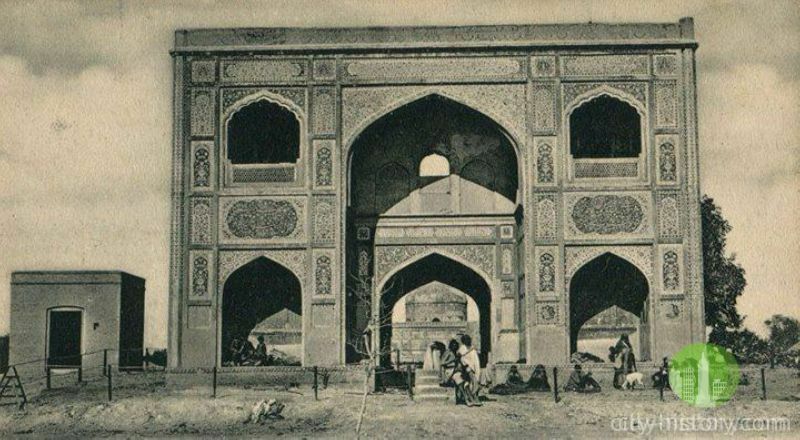 A lofty Timurid aiwan—a popular architectural rendering for gateways—rises to two-storey height, and incorporates a 40′ long covered walkway defined by a single storey cusped arch gateway. The aiwan is flanked on both sides with 5′ deep arched alcoves expressive of the two storeys of the structure. The covered walkway is lined on either sides with a 12’x12′ chamber, which no doubt provided accommodation to the guards, from where an internal staircase leads to the first floor. The 50′ wide facade, subdivided into slightly sunken panels presents one of the finest examples of kashi kari (tile mosaic). 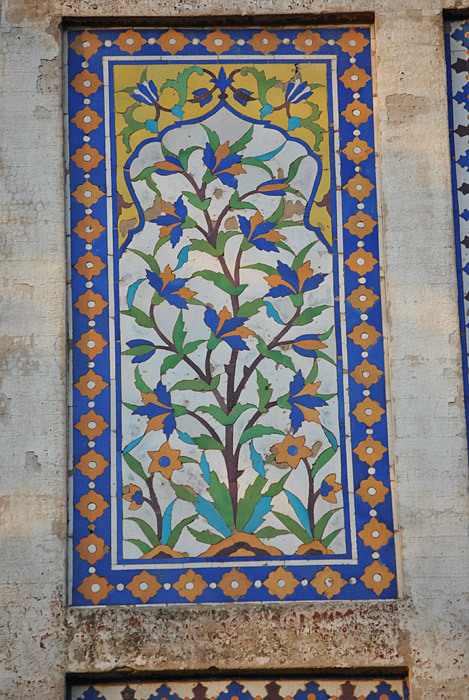 A familiar Mughal floral motif. 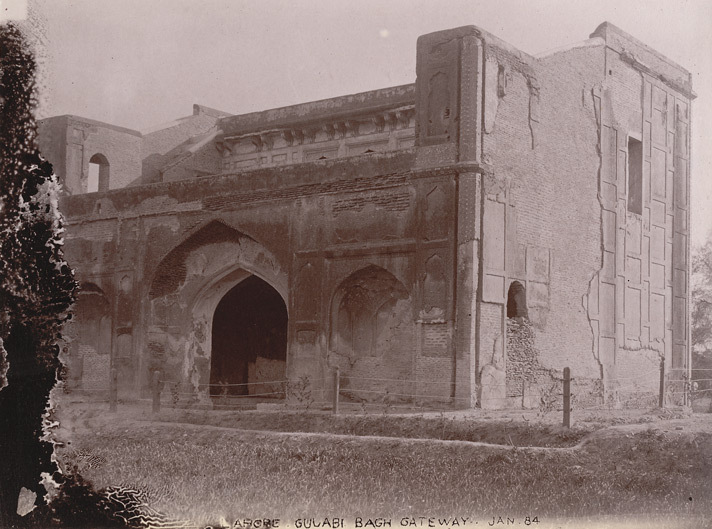 This photograph of a Gulabi Bagh Darwaza or ‘flower garden gateway’ in Lahore was taken by Henry Cole for the Archaeological Survey of India in 1884. 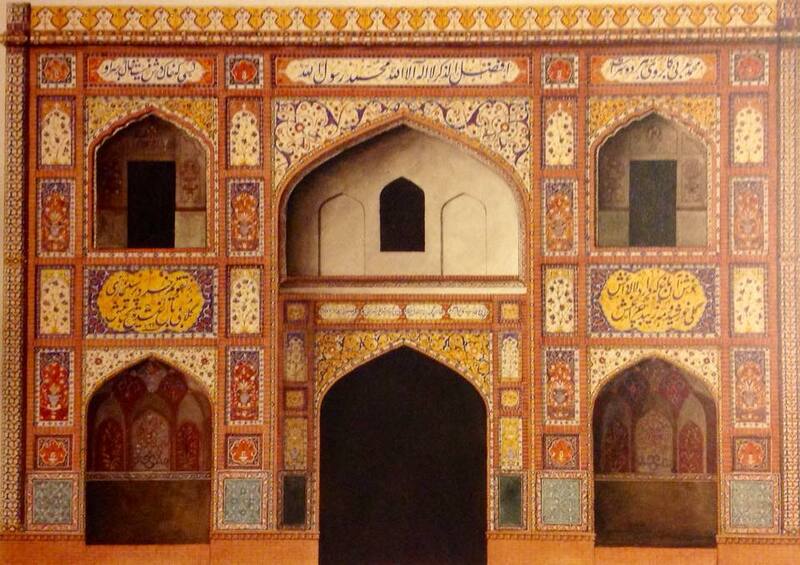 This entry was posted in Architecture, gardens, heritage, History, Lahore. Bookmark the permalink.